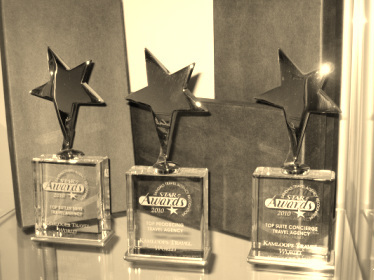 Kamloops Travel World and its agents have been recognized and honored at the 2009, 2010, 2011, 2013 and 2014 STAR Awards. 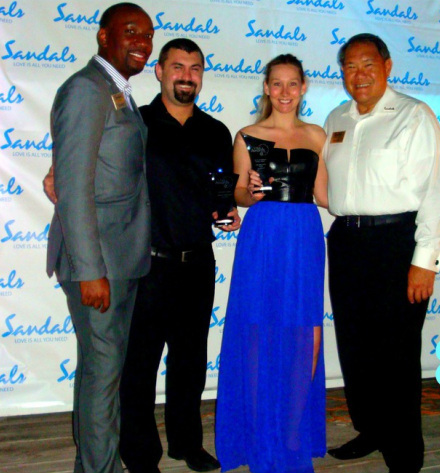 The STAR Awards are held each year in the Caribbean through Sandals and Beaches Resorts. The STAR Awards are an invitation only event which consists of conferences, forums and awards galas where guests of the Awards learn the most up to date information provided by the resorts. Nominees and Winners for the STAR Awards are determined by their growth and sales through North America. Kamloops Travel World's division in Western Canada includes British Columbia, Alberta, Saskatchewan and Manitoba. Deborah Jensen & Ryan Bullock accepted these awards. They have now accepted 8 national awards within 4 years. In addition, Ryan Bullock (one of our agents) was inducted into the "Chairman's Royal Club". An invitation only club for elite agents who have achieved top growth and sales each year. Each year agents world wide have an opportunity to be inducted into the prestigious club. The "Chairman's Royal Club" began in 2011 and has just 5 members from Canada! We're very proud of Ryan's accomplishments. We are proud to sell all Sandals products. We know the value in selling quality. We promote and sell product that we'd feel comfortable traveling to ourselves, which is why we travel to Sandals properties on our personal vacation. Without having experienced all the resorts first hand we wouldn't be where we are today. We learned in a short time that quality and value are more important to our customers than price alone. To all of our clients --- we thank you for all your support and business. We're thrilled to continue to grow and build our relationship with each of you. We're so proud to be a national award winning agency and we will strive to provide the best quality vacations to you.